Location of Hayward in Alameda County, California. Hayward is a city in the East Bay area of Alameda County, California. It has a population of 144,186. Hayward is the sixth largest city in the San Francisco Bay Area and the third largest in Alameda County, It is on the Bay's eastern shore, next to Union City. The San Mateo-Hayward Bridge starts there. Hayward is the 37th biggest city in California by how many people live there. The city was named after William Dutton Hayward, who opened a hotel in the area in 1852. People first lived in the area as long ago as 4000 B.C.E.. These people were the Native American Ohlone people. In the 19th century, this area became part of Rancho San Lorenzo, a Spanish land grant to Guillermo Castro in 1740. Hayward was the home to a big tomato canning company, the Hunt Brothers Cannery. The cannery was opened in Hayward in 1895 by brothers William and Joseph Hunt. The whole city smelled like tomatoes for three months of each year, when the tomatoes were ripe for picking, and they were being cooked for canning. It closed in 1981. Hayward has many business which make things, and many large companies have their offices there. PepsiCo has a bottling factory there. The Shasta soft drink company is in Hayward. The Role-playing game publisher Chaosium was based there. The High-tech company Dust Networks is in Hayward. The Mervyns department store chain was based in Hayward. It went out of business in 2008. The All Pro Wrestling school puts on shows in Hayward. Two businesses which had a lot of people working for them in the years 2000-2001 were Mervyns, with 2,000, and Pacific Bell, with 940. The United States Census Bureau says that the city has a total area of 63.7 square miles (165.1 km²). 45.3 square miles (117.4 km²) of it is land and 18.4 square miles (47.7 km²) of it (28.90%) is water. The Hayward Fault Zone runs through Hayward. 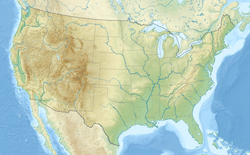 The United States Geologic Survey has said there will probably be a big earthquake on this fault zone. This earthquake will probably cause a lot of damage. Other cities next to Hayward are Union City, Fremont and Pleasanton. The 2010 United States Census said that 144,186 people, 45,365 households, and 32,559 families resided in the city. There were 3,181.3 people per square mile (1,228.3/km²). The people in the city were 34.2% White (18.8% not Hispanic), 11.9% African American (11.3% not Hispanic), 1.0% Native American, 22.0% Asian, 3.1% people from islands in the Pacific Ocean, 20.8% from other races, and 7.1% from two or more races. 40.7% of the population was Hispanic or Latino of any race. There were 48,296 houses. 52.8% were lived in by their owner. 47.2% were lived in by people renting the houses. The mayor of Hayward is Barbara Halliday. Interstate 880 and Interstate 238 go through Hayward. BART has two stations in Hayward. Amtrak, the US passenger train, has a stop in Hayward. Hayward has a small airport, the Hayward Executive Airport. The Hayward Hall of Justice is a branch of the California Superior Court. It is the largest courthouse in Alameda County. California State University, East Bay, once known as California State University, Hayward, is mostly located there. It is part of California State University. Hayward also has Chabot College, a community college where Tom Hanks went to school. Hayward has four parks in the East Bay Regional Park District: the Don Castro Regional Recreation Area, Dry Creek Pioneer Regional Park, the Hayward Regional Shoreline, and Garin Regional Park. Hayward has a lot of parks. The Hayward Area Recreation and Park District is the biggest in California. Hayward has two buildings in the National Register of Historic Places: the Green Shutter Hotel and Eden Congregational Church. A third Historic Place, Meek Mansion, is close to the city. The three buildings are also California Historical Landmarks. Ukraina Honcharenko is another Historical Landmark in the city. Some of the people from Hayward are: the Ukrainian patriot and Greek Orthodox priest Agapius Honcharenko; football coach Bill Walsh; figure skater Kristi Yamaguchi; Treasurer of the United States Rosa Gumataotao Rios; Dwayne Johnson, also known as "The Rock", professional wrestler and actor; and Bill Lockyer, California politician, former Attorney General and State Senator, now the State Treasurer. ↑ ""Acceptance of Cannery Water Tower from ConAgra, Inc.", City of Hayward document, 2004 (pdf)" (PDF). Archived from the original (PDF) on July 19, 2010. Retrieved May 26, 2012. ↑ "Hayward cottages now owned by Caltrans considered for historical designation". ContraCostaTimes.com. Retrieved January 8, 2013. ↑ 3.0 3.1 "ACCESS HAYWARD". Retrieved February 18, 2015. ↑ "Hayward". Geographic Names Information System. United States Geological Survey. January 19, 1981. Retrieved December 23, 2016. ↑ "California Cities by Incorporation Date". California Association of Local Agency Formation Commissions. Archived from the original (Word) on October 17, 2013. Retrieved March 27, 2013. ↑ "Mayor & City Council". City of Hayward. Retrieved September 19, 2014. ↑ "Senators". State of California. Retrieved March 18, 2013. ↑ "Members Assembly". State of California. Retrieved March 18, 2013. ↑ "California's 15th Congressional District - Representatives & District Map". Civic Impulse, LLC. Retrieved March 14, 2013. ↑ "2016 U.S. Gazetteer Files". United States Census Bureau. Retrieved July 19, 2017. ↑ "Hayward". Geographic Names Information System. United States Geological Survey. ↑ "ZIP Code(tm) Lookup". United States Postal Service. Retrieved November 21, 2014. ↑ Stanger, Frank M., ed. 1968. La Peninsula Vol. XIV No. 4, March 1968. ↑ "City of Hayward 2010 Comprehensive Annual Financial Report"
↑ Injex Industries, Inc. – Contact. Injexindustries.com. Retrieved on 2010-12-25. ↑ It's Official: CSU Trustees Vote Unanimously To Change University Name to 'Cal State East Bay'. Calstate.edu (2005-01-26). Retrieved on 2010-12-25. ↑ Hayward Area Recreation and Park District. Haywardrec.org. Retrieved on 2010-12-25. ↑ OHP Listed Resources. Ohp.parks.ca.gov. Retrieved on 2010-12-25. ↑ :: City of Hayward – The Heart of the Bay :: ACCESS HAYWARD. User.govoutreach.com (2006-10-06). Retrieved on 2010-12-25. Wikimedia Commons has media related to Hayward, California. This page was last changed on 30 November 2018, at 20:02.